(17777, Rose Strothman Collection, OHS). Born October 21, 1885, in St. Louis, Missouri, to Zack and Agnes Mulhall, Lucille Mulhall is celebrated as the first cowgirl, an appellation bestowed by Teddy Roosevelt after seeing her ride at the Mulhall ranch. Legend has it that Roosevelt told her if she could rope a wolf, he would invite her to his inaugural parade. She came back three hours later dragging a dead wolf behind her. Although "cowgirl" had been in use since the year of her birth, few would argue that she was the first to give the word national meaning. She was among the first women to compete in roping and riding events against men and earned such titles as "Champion Lady Steer Roper of the World" at the Winnipeg Stampede. She starred in Mulhall's Wild West, the Miller Brothers' 101 Ranch Wild West show, and in vaudeville. In 1913 she formed her own troupe and in 1916 produced her own rodeo, Lucille Mulhall's Roundup. She was married briefly in 1908 to Martin Van Bergen, a cowboy singer who opened her act and by whom she had a son. She was married for three years to Tom Burnett, whose father, Burk, established the Four Sixes Ranch in Texas. Around 1922 Lucille retired to the family ranch in Mulhall. She was killed in a car accident on December 22, 1940. 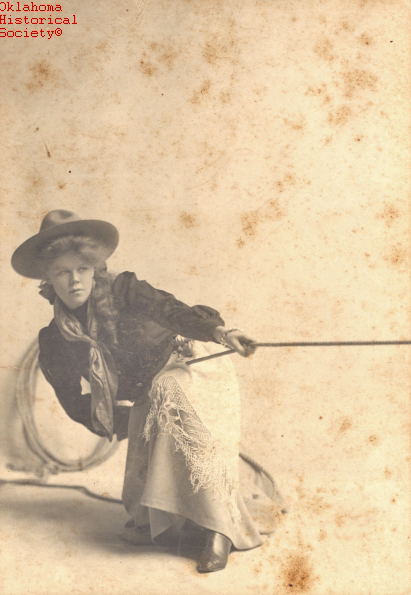 Lucille Mulhall's popularity was due to her skill, the result of perfect timing with her rope, unusual balance on her horse, and her diminutive size and ladylike demeanor. Most important, she was authentic, coming from a genuine ranch background. She was inducted into the Rodeo Hall of Fame in 1975 and National Cowgirl Hall of Fame in 1977. Martha Burr, "The American Cowgirl: History and Iconography, 1860-Present" (Ph.D. diss., New York University, 1998). Beth Day, America's First Cowgirl, Lucille Mulhall (New York: Julian Messner, 1955). Kathryn B. Stansbury, Lucille Mulhall: Her Family, Her Life, Her Times (Mulhall, Okla.: Homestead Heirlooms Publications, 1992). Joyce Gibson Roach, "Mulhall, Lucille," The Encyclopedia of Oklahoma History and Culture, https://www.okhistory.org/publications/enc/entry.php?entry=MU006.